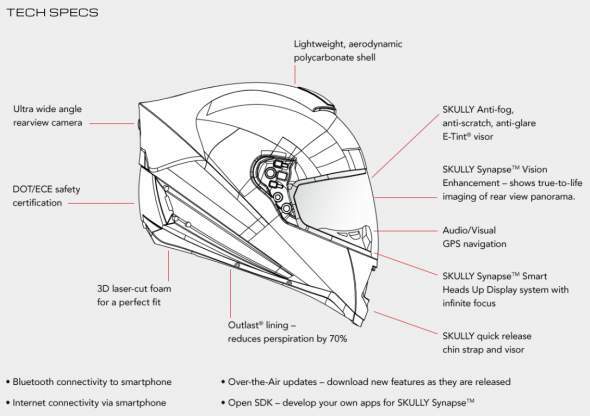 Remember the Skully AR-1 Augmented Reality Helmet? Well it is now ready for pre-orders which will ship in May 2015. I almost bought one… but I didn’t. Read on for why I couldn’t pull the trigger on a Skully AR-1 Helmet, yet. 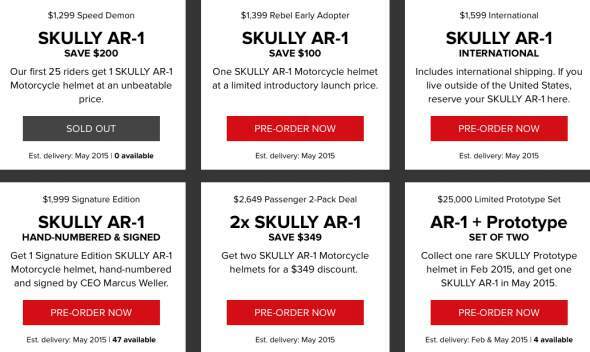 I wanted to buy a Skully AR-1 helmet, I got up early for today’s pre-order announcement hoping for more details. I believe in the vision of this helmet and ultimately think that Skully, or another brand, will have great success with the product eventually. 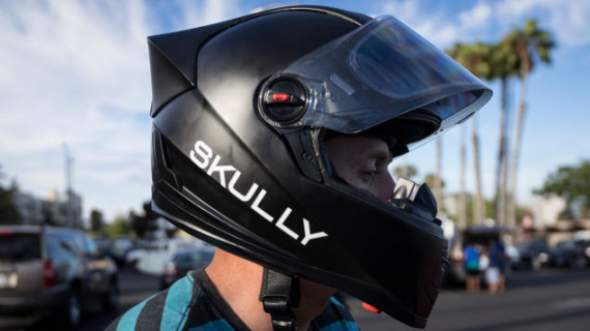 Heck, Skully may make the “perfect” helmet with their first try. The tough part, for me, is spending $1,300 for a helmet with very light specs and/or demonstrations. The current specs are very 30,000 feet which is fine to rally the troops and get people excited. But when it comes to getting the wallet out of my pocket I need more specifics. Some things that I need to see in advance with better pictures or video would be how the heads-up display actually looks, how the E-Tint Visor is controlled, how the app works for adjusting the camera and other settings, how integration between GPS/Map, music, and phone calls actually works. You get the idea. Just telling me that the unit has an E-Tint visor doesn’t do it for me. I want to make sure it isn’t just the “stick-on” version offered here. I would also like to know if the tinting is automatic or manually controlled, etc… In other words, there are too many unknowns. With that said, I am very much the early-adopter type. I have one of the early releases of the Tesla Model S, I tend to buy every iPhone on day one, heck I even bought the Boosted Boards Skateboard on day one from Kickstarter. But in each of these examples they either had great websites with plenty of details or a history of previous products that were successful. Skully, currently, has neither. So why am I so scared to spend $1,300 for a Skully AR-1 helmet with little details? There is a bunch of integration and technology in this helmet that has the potential to be executed awfully or amazingly. Without more information or detailed product reviews I have to wait.